With the increased use of smartphones and tablets, services at Vassar Road Church in Poughkeepsie, New York, have had a few unexpected interruptions. Those types of distractions or the inevitable phone call in the middle of prayer time may be why most people oppose using cellphones in church. According to a Pew Research survey, 96 percent of American adults say it’s “generally not OK” to use a cellphone at church or during a worship service. More opposed use in church than at the movies (95 percent), during a meeting (94 percent), or at family dinner (88 percent). Carter Smith is part of that quarter of Americans. At Refuge Church in Ogden, Utah, Smith says he has used his smartphone during the service. “I’ve used it for alternative translations in a Bible app, taking notes, and finding references,” he says. Reading a Bible on a smartphone, unknown a decade ago, is increasingly common. In the last five years, the percentage of those using the Bible on their phone has more than doubled, according to the American Bible Society—18 percent of Bible readers used their smartphones to access the Bible in 2011 versus 40 percent in 2015. Much of that mobile usage comes from YouVersion, the free Bible app from Oklahoma-based Life.Church. The app has been installed more than 200 million times since its launch in 2008. According to Bobby Gruenewald, founder of the app and a pastor at Life.Church, users share two verses every second, which means more than 172,800 pieces of Scripture are shared through texts, in emails, and across social media every day. “Year after year, the main trend we see is a growing number of people across all generations and cultures desire to connect with the Bible digitally,” he says. That’s the case for Michael Morris. As a worship pastor at Purpose Church in Pigeon Forge, Tennessee, he uses his phone constantly in church. “I use it for everything, not just the Bible app,” he says. He shares sermon video clips and quotes on social media and uses music apps for the worship service. But the influx of smartphones into the worship service isn’t entirely without consequence. Smith says he prefers a print Bible because using his phone brings the temptation to do other things. He admits he has sent an occasional text or a tweet during the sermon. For Courtney Cook, a member at Burnt Hickory Baptist Church in Powder Springs, Georgia, the phone can be a distraction even when she uses it only to read the Bible because of pop-up notifications from other apps. With what she estimates to be a third of her fellow millennials and a growing number of previous generations using a mobile device in her church, Cook says the never-ending notifications can hurt the focus of many in the congregation. “The notifications, texts, emails, and whatever else might alert you can easily distract you and the people around you,” Cook says. Like most 20-somethings, Kelsey Bridges appreciates the convenience of having the Bible on her phone, but the negatives of using it in church outweigh the positives for her. “Once that phone is in my hands, my mind jumps to texts, Twitter, Instagram, email, and Facebook,” says the member of The Summit Church in the Raleigh-Durham area of North Carolina. It’s that connection many, including millennials, miss when they click on an app instead of opening the pages of a Bible. Churches can certainly adjust and capitalize on the mobile technology, but they shouldn’t forget that many attending, including young adults, prefer and appreciate reading the old-fashioned way. And for those who do use their smartphones in a worship service, rest assured the pastor is well aware when worshippers are doing something other than reading the Bible. It doesn’t take songs interrupting the service, says Dunlow. When people never look up during the sermon or their hands are constantly scrolling on the screen, it’s a “dead giveaway,” he says. 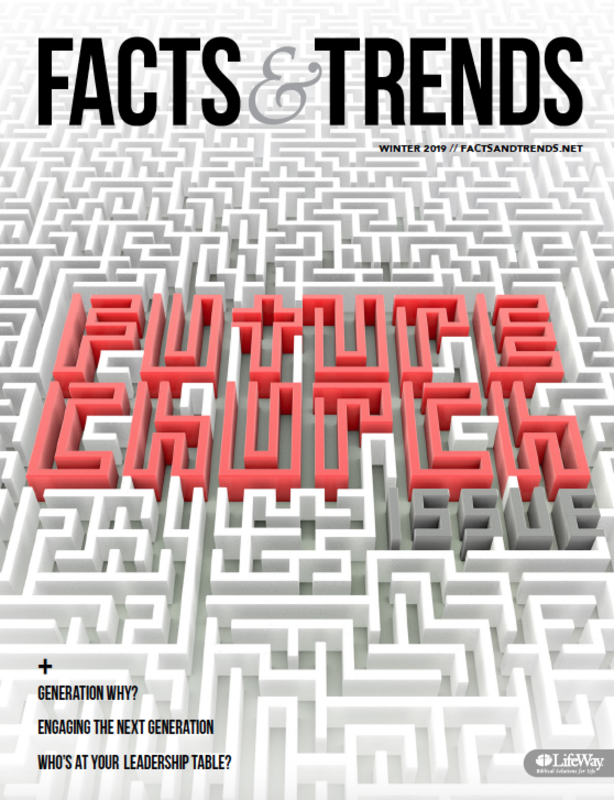 Read more from this issue at FactsAndTrends.net/SmallChurch. I remember the fellow who watched the ball game form a small tv on the back row at church on Sunday nights. Guess he thought no one knew. It was especially bad because he was the Chairman of the Personnel Committee and a Deacon to boot.